It’s always so much fun at the office! FIRST, it was failed air conditioning (during the hottest week of the summer), which drove the interior temperature high enough that the boss decided to send everyone home. That happened twice. THEN, it was rats in the parking lot. The rats seem to be gone now. Either they’re all lying in a pile after suffering death by poisoned peanut butter, or they decided to try their luck at a more amicable building site. I never did get a decent picture of the little beasts. NEXT, it was a seriously flooded basement in the office building. Fortunately, none of our files were damaged, but when I went downstairs to assess the damage, I could see water marks in the other rooms – some marks as high as two feet! Workers were down there for a week or more removing damaged items, tearing out walls, and doing whatever else was required. 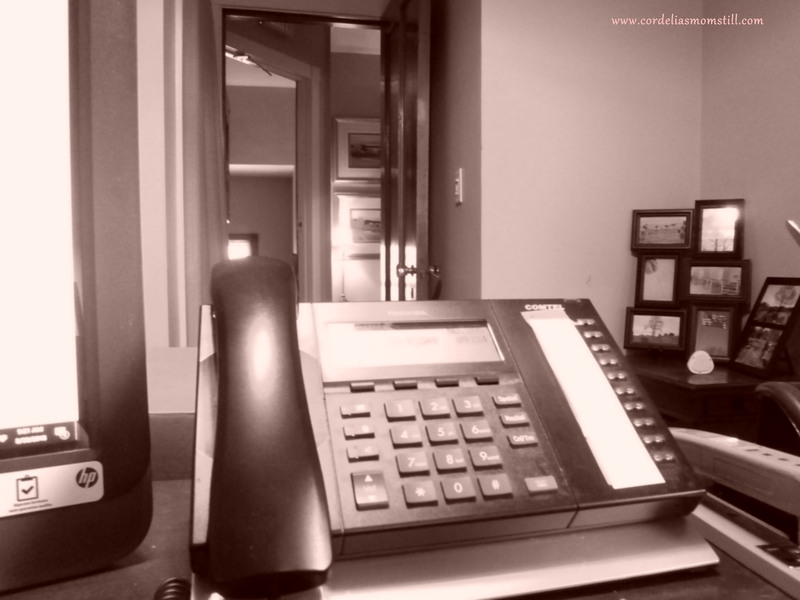 The noise got pretty bad at times, and I had to shut my office door in order to think. By the end of that week, I figured the work would probably finish up on Friday, my day off. I went home on Thursday and enjoyed my weekend. 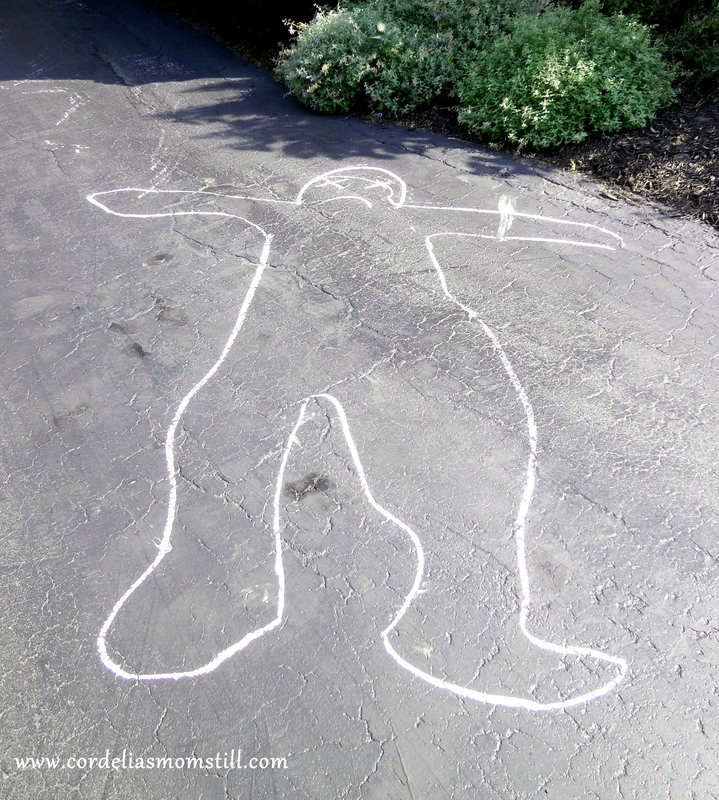 Since there was no accompanying police tape, there had been no news stories of a murder or other death near my office, and the drawing seemed just a bit too short to be the outline of an actual person, I assumed it was a practical joke by one of the basement workers. But I admit, the first sight of that drawing was a little jarring – and the feeling was further borne out when my boss arrived, followed soon thereafter by a client. My boss took it in stride, but the client seemed to view it a little more seriously than anyone else. I’m not sure our reassurances sufficed. It rained again yesterday, and the drawing is gone. I kind of miss it. Although personally, I think it would have been funnier had the prankster drawn a giant dead rat instead. This entry was posted in That's Life and tagged body outline, chalk drawing, driveway, job, office, pests, rats, work. Bookmark the permalink. Has it occurred to you that the rats may have drawn it…. as a warning? since it wasn’t an actual crime scene, i find it hilarious! I did, too. The client? Not so much. The soft, curvy outline makes me wonder if it’s for a dead smurf. Smurfs may seem like they’re always happy, but they have troubles too. Nah, they would have had to use blue chalk in that case. Don’t smurfs turn white after they die? I don’t remember. Do they? Or are you pranking me again? Me?! I would never prank you. I do believe that smurfs turn white after they die. And after a little while their fluffy bodies shrivel up into a ball of cotton and float away to smurf heaven. Better at the office than at your house. Good point. Definitely don’t want rats at my house! Definitely always something 😀 Happy long weekend to YOU. Same to you, Marilyn (and to Garry, too). A giant rat outline would have been THE BEST! Let’s hope the cycle is complete and normalcy takes reigns again! Yes, but then what would I write about? I think I competitor drew it to scare off clients, CM. Nah, our clients are very loyal, and there are very few other firms here that specialize in US-Canadian cross-border estates and trusts law. LOL. Goodness, looks like you had a fat gingerbread man homicide over there. Hang tight. It does look like a gingerbread man, now that you mention it! Maybe it was bait for the rats. It looks like the Pilsbury Dough Boy. Ha! Maybe the basement worker was simply hungry. Seems to me that the rats have developed a sense of humor. Either that or they are warning you! Too much!!! A practical jokester is in your midsts. Who? I believe the practical joker was one of the workers who was cleaning out the building’s basement. He only speaks Spanish, however, so I can’t ask him.